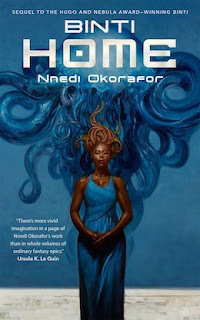 For the November book discussion of the Chicago Nerd Social Club, we read Binti and Binti: Home by Nnedi Okorafor. The first two parts of a novella trilogy, these works follow the titular character, a mathematically-gifted young woman who is the first of her people to travel off-planet for education. Along the way, she becomes a kind of unintentional liason with the warlike Meduse; Binti: Home follows her first return to Earth. These were generally-agreed to be very fun reads, with some critiques. While the first novella is pretty self-contained, we noted that the second installment cliffhangers rather seriously. 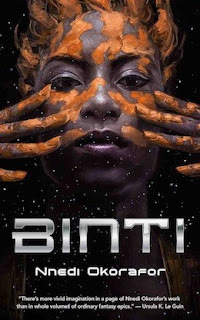 We thought that some elements of Binti 1 were "kinda beta-testy": lots of buildup and world-development, with all the action kind of abrupt at the end. The edan & otjize were described as kind of "double Macguffins"; the plot doesn't work without them in place at the right time, but it kind of seems an accident/poorly explained. A few us were kind of surprised at how closely the Himba are based on the actual culture, including the otjize. We noted the "reaction shot first" approach, where Binti's reaction to something is described before the thing itself. Not bad, per se, but different, and kind of YAish. Some critiques of how math is used here, with some of feeling it's pretty much a 1:1 stand-in for magic. Binti doesn't actually use math to solve anything, she just recites unrelated formulas or equations to go into a trance-like, powers-activated state. Point of debate. We contrasted the use of science & math here with the way magic & science work in All the Birds in the Sky (which we discussed a while back); we do like that there's not that kind of binary in Binti. Talked a bit about the outsider/hybrid returning home motif. Some compared Binti's hybridization with the film District 9, which is a bit ironic given that Okorafor's Lagoon (which we also read a while back) was written explicitly against that film. We also noted hybrid, mixed-race ideas in Butler's works (like Bloodchild & the Xenogenesis trilogy), which are likely influences here. We're intrigued by the odd couple friendship between Binti & Okwu, but we haven't seen much of it yet. It's not bad, just odd, that the perspective is tight on Binti's immediate family/culture in Home—we don't know what the rest of the planet is like, which seems relevant to interstellar war & politics. Gunfire breaking out at the first Meduse ambassador's visit to Earth, for instance, just seems...odd. As is the Chicago Nerds way, we wondered where Binti fits on the pluckmeter scale. And it's okay! We did wonder a bit about how much agency she has; there are some big momentous decisions she makes, but a lot of the action is also just her going & doing what other people tell her to, even when she doesn't have the information to evaluate it. Pet peeve of mine, but I was a little irked to run into "ancient aliens" as a big plot point. That got us into long discussion of other works where we think the trope is used well, including Banks' Culture novels, Jemisin's Fractured Earth trilogy, the Expanse, and particularly the Mass Effect trilogy. A lot of discussion of how these stand up in comparison to Lagoon and Who Fears Death, which many of us had read. Some critiques of the writing here, a kind of thorny question of what's stylistic versus editing fails—things like unintentional ambiguity, adjective order, comma placement, etc. "Cormac McCarthy is bad at punctuation." Question raised of what we think about the lengths of these works. Majority of us strongly praised the novella length! Noting that these are nearly the length of what used to be acceptable shorter novel size, and expressed, as a group, some frustration with the "novel bloat" still affecting the genre. Talked a bit, and very positively, about how e-sales are allowing a resurgence of shorter forms, led by Tor. Strongly encouraged to check out Okorafor's twitter, which is pretty great. Also suggested to check out her recent TED talk. Good discussion! Next time for the Chicago Nerds book-club, we're reading Lovecraft Country by Matt Ruff, followed by Sourdough by Robin Sloan in January. Keep up with the Chicago Nerds on their website & Facebook, and also be sure to check out all the events coming up with our lovely hosts, Open Books.